The day started with snow flurries and was bitterly cold again - we wondered if it were cold enough for those polar bears yet? Anyway, the bears would have to wait for us today! Before searching for the bears, we'd arranged to meet the owner of a dog yard out along the Hudson Bay coast a few kilometres away from the Churchill Wildlife Management Area. These cute canines are Canadian Eskimo Dogs, a breed which is unfortunately nearing extinction with only around 279 registered animals in existence. The Canadian Eskimo dog is one of the rarest dogs in the world but was once an important part of the paleo-Eskimo culture and their every day life dating back hundreds of years. As well as being used for transportation, they also assisted during hunting and were good protectors by keeping predators at bay. A hard working breed, the Canadian Eskimo Dog can pull twice it's own weight and withstand the harshest weather. Today was a pretty bleak day and these dogs looked to be in their element! 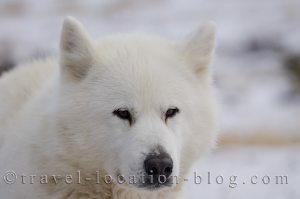 The Canadian Eskimo Dog is the official provincial dog of Nunavut, Canada's newest and largest territory. In August 1988 Canada Post issued a series of four Canadian Kennel Club stamps featuring 4 breeds of dogs native to Canada which included the Canadian Eskimo Dog. At the yard, the dogs were fed just prior to our visit and were all occupied with their food when we arrived. However, as soon as we got into the yard they went crazy. The dogs are tethered by a chain to a cable which runs along the ground and each have their own little piece of real estate. These energetic dogs have worn a well defined circle in their lots with their constant pacing and movement! They all have their own personality, one chap walked in circles for a full 2 hours with his bone in his mouth - obviously the daily workout. When he wasn't walking he was chasing his tail. Some slept while others barked occasionally at the wind or falling snow. It was great entertainment! After watching the dogs a while we caught sight of a large polar bear in the distance - he was laying down in the forest and seemed disinterested by the noise the dogs were making with their barking and activity. We ended up sitting in the yard for around 6 hours but the bear did little more than raise its head or shift sleeping position - talk about frustrating!! We left the dog yard at around 4:30pm and headed over to our usual spot on he circuit we drive. We found no polar bears there but we found a little something else. Up on a rocky ledge was a big white spot, whiter than the snow! When we tuned the binoculars onto the subject which was several 100 metres away, it looked like a hare but it was huge and looked larger than a cat. It was also sitting completely motionless! We decided it was either a trick of the eye or someone was playing a prank on us. It was very far away so we couldn't get a shot of it to confirm but wondered if perhaps our faces would appear on Candid Camera or something. When we came back to the spot 20 minutes later it still hadn't moved a whisker. By 5:00pm we packed it in for the night and headed for home. The drive back to Churchill from the Churchill Wildlife Management Area takes around 20 minutes and by the time we got in it was getting dark and even colder. We spent the evening chatting with our fellow guests and sharing our various experiences from the day - from those that enjoyed a tundra buggy adventure to the story about our hare. We were stumped when they told us they had seen an arctic hare which was massive - larger than a domestic cat. We started to realise that what we'd seen was in fact the same. We will confirm our finding tomorrow when we visit the same site - if the animal is still there, it's a hoax, if not it was almost certainly an arctic hare! Tune in tomorrow for the outcome.